While most entrepreneurs know the value of a perfectly polished elevator pitch, getting insights on what investors are looking for could be the difference between closing a deal and closing their business. A lunch and learn on July 15 at the Wake Forest University Charlotte Center brought a distinguished panel of angel investors, venture capitalists and bridge investors together to offer a behind-the-scenes look at the criteria they use to evaluate investment opportunities and assess those elevator pitches. 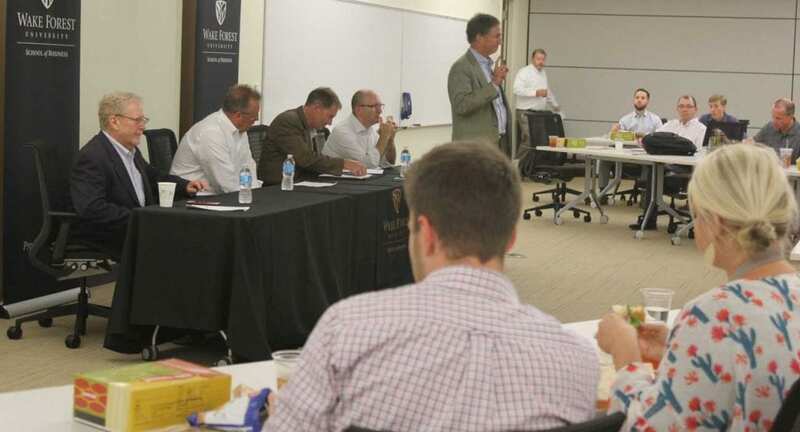 About 70 students, alumni, prospective students, and members of the business community listened to a panel moderated by Stan Mandel, executive professor in entrepreneurship at the School of Business. “I learned that having customers is more important than having revenue,” said Anitha Vojjala (MBA ’15) of the panel. She said the opportunity to hear directly from industry experts about their perspectives on valuation was beneficial.